Through her work, Cecilia Danell explores ideas about wilderness, solitude and how the yearning for an authentic life may be no more than a construct. This new body of work is based on walks in the area surrounding her family farm in Sweden, where the experience of being in the landscape influences her practice beyond the primary photographic source material. Danell details each walk through maps, photographs and notes in her journal but when in the studio, the quality of oil paint and the hands-on process of making become as important to her as the initial source material. Danell’s artworks suggest that there is a longing to return to a more primal state; to wrap oneself in a place and become a part of it; to satiate a longing to become part of a place. The untimely death of her father in 2018 has led Danell to think more about her ties to the place that has been so integral to her family experience, a location filled with residual memories as well as contemporary encounters. In a Landscape takes its title from the John Cage composition of the same name. The composition has no climax and the landscape that Danell depicts is similarly quiet. This is a landscape that is flat, where there is no tourism, no heroic peaks. Only a still inland landscape of beaver damaged trees, irrigation ditches, fields and managed forestry. She walks and traces an environment that she knows intimately, happening upon decaying remnants of human activity, further upending the romantic notion of nature as untended wilderness. Using the landscape as a metaphor for the human condition, Danell shies away from nostalgia, while solemnly recognising how people and places change overtime while remaining superficially the same. Yet, Danell’s work always draws the viewer back to the construct of the artwork; the painted landscape is melting; ocular glitches of unnatural colour present themselves as part of the scenery. The objects are imitations of something real, falling short of true semblance. Cecilia Danell, born 1985, is a Swedish-born, Galway-based artist working with painting, film and installation. Recent exhibitions include: Winter Wanderer (solo) Kevin Kavanagh Gallery, 2019, Futures, Series 3 Episode 2, RHA, 2018, Island Life, Kevin Kavanagh Gallery, 2018, Beep Painting Biennial, Swansea, UK, 2018, The Last Wilderness (solo) at Galway Arts Centre, 2017 and The Dock, Carrick-on-Shannon, 2017. She was a 2017 recipient of the Arts Council Next Generation Award and has previously received Arts Council Bursary and Project Awards, the 2011 Wexford Arts Centre Emerging Artist Award and a 2016 residency award at the Nordic Artists Centre Dale, Norway funded by the Norwegian Ministry of Culture. A publication on Danell’s work with an essay by Sue Rainsford was launched in March 2017. Danell’s work is in the collections of the OPW, Kelly’s Resort Hotel, Rosslare, Galway City Council, Wexford County Council and Motala Municipal Council, Sweden. 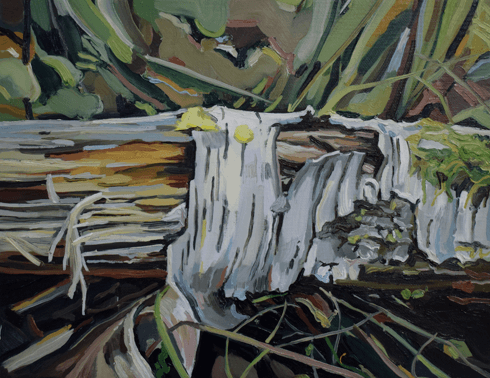 Image: Cecilia Danell, Birch, 2018, Oil on canvas, 27 x 35cm, Image courtesy of the artist.